When travelling to Seville, save with our train tickets Barcelona - Seville. We are aware that facilitating the online management of train tickets Barcelona Seville is what users demand, of course in addition to the best prices, and we want to work for you, so we expose you the advantages of booking trains Barcelona - Seville with us, and we also facilitate the booking of the most suitable and cheap train tickets Barcelona Seville according to your needs and possibilities. Welcome to the train tickets Barcelona - Seville at super good price. Also for the return, Trains Seville to Barcelona. You will notice that with our train tickets Barcelona - Seville search engine you have the cheapest train tickets from Barcelona to Seville at your disposal, and if we know how to choose some specific offers when booking the train ticket Barcelona - Seville we will be in the cheapest among the already very cheap. Itâs evident that we have the cheapest train tickets Barcelona - Seville. Trains Seville with Talgo for only 22,85 €. On the other hand, you may know that some of the advantages of choosing to travel by train, either from Barcelona to Seville or on any route, are their speed and punctuality, well, even though it is a fast transport, we can decrease the time we spent on the train journey from Barcelona to Seville if we need to get as soon as possible to Seville. Hoard the cheapest train tickets Barcelona - Seville. The search for the train ticket from Barcelona to Seville with the cheapest price was made on the 24/03/2019 a las 00:10 h, it is a Talgo train with departure on the 09/04/2019 a las 9:30 h and arrival on the 09/04/2019 a las 20:51 h. The price of the cheapest ticket has been 22,85 € and the cheapest rate with which this price has been possible has been the rate Promo . Trenes.com issues official Tren Barcelona Seville tickets and it does totally legally as a verified and authorised travel agency by Renfe, ie if you buy a Tren Barcelona Seville ticket through our website, you only need to print the ticket or to show the bidi code sent to the mobile phone, present it at the Barcelona Sants station and get on the train you have got assigned. On it you can see the ticket number 7494800625274, the locator SJPZ7N, the origin and destination stations, in this case the train travels from Barcelona Sants to Sevilla Santa Justa. The railway operator Renfe, the train type TALGO, the train number 00697 and the rail car 011. The contracted rate Promo in Turista class, the assigned seat 04D, the price for the ticket, this Barcelona Seville train ticket is not necessarily the cheapest ticket since the price of the train ticket often depends on the time in advance with which you bought the ticket. In this case the price is 31,45€ and the departure date is 06/04/2016. The train departure time of this ticket is at 09:27 h and the arrival of this train at the Sevilla Santa Justa station is at 20:51 h. The duration of the journey from Barcelona Sants to Sevilla Santa Justa has been 11 horas 24 minutos. We give you some guidelines so that you can save even more on your train tickets Barcelona - Seville and/or travel the 829 Km of route there are between Barcelona and Seville as fast as possible. 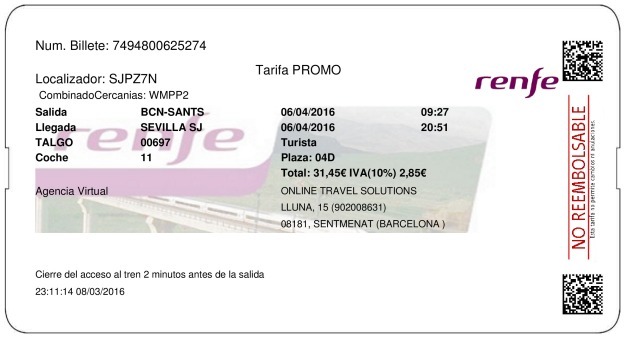 You will pay an average of 79,11 € for your seat on the train from Barcelona to Seville. You can check the train timetables for trains from Barcelona to Seville on Train Timetables Barcelona to Seville. With regard to prices, the cheapest train tickets Barcelona - Seville that the search engine delivers are prices of 22,85 €, however, if you are open to travel on different dates, check every day our search engine because its possible that this prices vary slightly, but we can ensure you today, that you have the train tickets Barcelona - Seville from 22,85 €, up to 198,50 €. 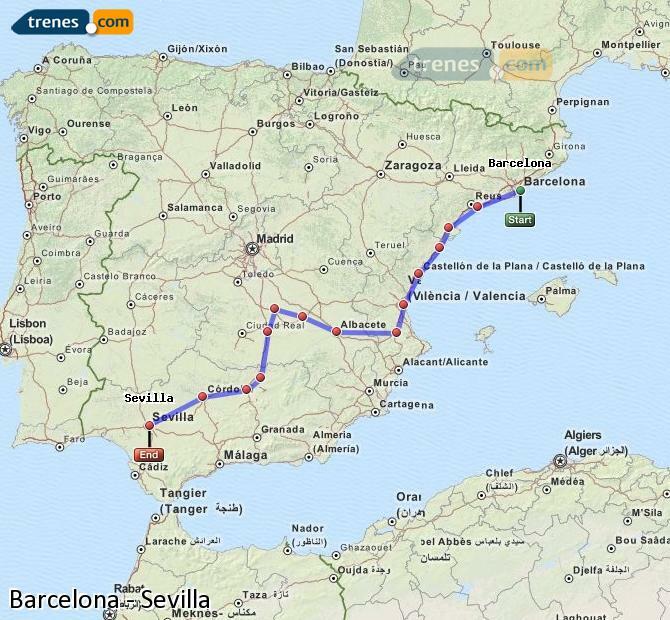 How can we access train tickets Barcelona - Seville for only 22,85 €? Go for train tickets Barcelona - Seville for Talgo trains which are the cheapest ones for this route in particular. The least polluting means of transport by road is the train. If what we want is to arrive at Sevilla Santa Justa as soon as possible, one of the options in this case is to think about booking the train tickets Barcelona Seville for AVE trains. Although we offer the best prices in all cases, the AVE train on this route is not the cheapest one.